As much as I adore AFL football and cricket, I actually think the soccer ones are the best yet. Maxx’s little brother, Rexxy, was too small for footy, but he’s big enough to join the Stone Valley Saints on the soccer pitch. The only problem is, he’s not that great at soccer, so Maxxy has to look after him. It’s a 3-game Knockout Tournament and it’s a rough ride for the Rumble boys. They’ve got to deal with cheating geniuses, bullying pirates and the most terrifying of all, a love spell. But if they can battle their way through all of that, they might just end up the Soccer Knockout Premiers! 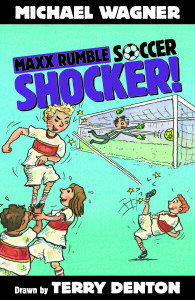 I’ve also got to thank a young man called Lachlan Blain, who wrote an excellent Maxx Rumble soccer story that really inspired this series. Thanks Lachlan, you’re a star! ‘Terry Denton’s drawings are priceless! The language is spot on, and the laughs are endless. 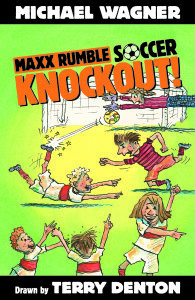 This is a no-holds-barred soccer game full of excitement, devious shots, brilliant brain work and lots of fun. 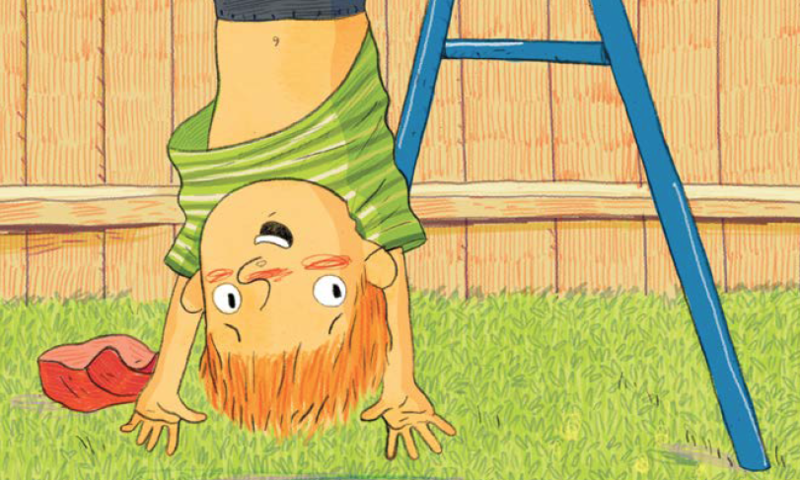 Aimed at boys of the 8+ age group who are interested in physical activity, this chapter book series will crack them up and draw in reluctant readers easily. The first of three books, I advise parents to buy all three together as they will be digested quickly.’ Buzz Words review. 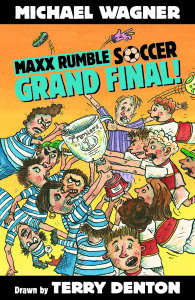 ‘The combination of two of Australia’s most hilarious creators of children’s books has resulted in a hoot of a series with soccer as its basis. Perfect for boys or girls.’ Krista Bell, acclaimed author and book reviewer on ABC Radio Queensland.